Phase 2 brought the addition of some more relaxed breakout areas and meeting spaces. The ground floor area utilised Flex flip top meeting tables in a Walnut veneer finish to allow for an executive feel but with maximum flexibility. These were partnered with upholstered Catifa chairs. 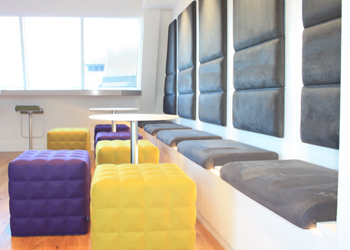 In the same area a breakout space was created using Catifa cafe chairs and Lem bar stools in a bespoke green leather. The second floor used the Lem bar stools again but also used Buzzicube 3D stools and Brio tables with intelligent laminate to go alongside the bespoke seating area. In phase 1 Bond Davidson opted for F25 desks 5 with sliding desk tops, Rotasoc power units, Cygnus monitor arms with razor mounts and thin client holders, these are complimented with the Do task chair . As well as the workstations WE helped to develop a very comprehensive storage solution using storage wall from James Tobias which included a bespoke lacquer finish for lockers, recycling areas, postal area as well as other general office storage areas and coat cupboards. The meeting room on the first floor has proved to be a great success utilising a glass Unitable with cable access and leather Una chairs to give a very executive feel. Other products we supplied in the first phase include Catifa lounge chairs and seated and standing meeting hubs from the Away from the desk range.